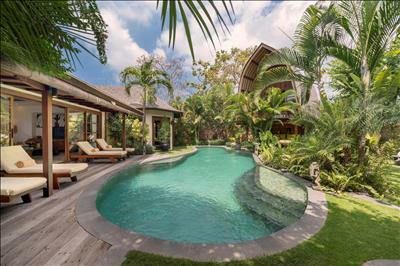 Unique, impressive and exquisite; this breath-taking 2-bedroom luxury villa with private pool blends Javanese form with contemporary and original interior design. A stepping-stone path over Koi-filled ponds sweeps into the main pavilion, where the ‘piece de resistance’ is the magnificent open-plan living area framed by a Javanese antique teak hand carved structure, and surrounded by water on three sides to give a feeling of a floating palace. Decked with a glittering chandelier, floor lamps with fun and funky feathered lamp shades, a teak wooden bar, this is the ultimate party house. A large, polished wood table seats up to 12 people on ornate red velvet chairs. A private terrace looking out onto a translucent blue free-form swimming pool can host our famous in-villa chef’s BBQs, parties and dinners, so is immensely popular for small blessings, weddings and ceremonies. The huge master bedroom features a super king-size bed and looks out onto the sun-drenched pool, while a second bedroom suite ensures all guests sleep in style. 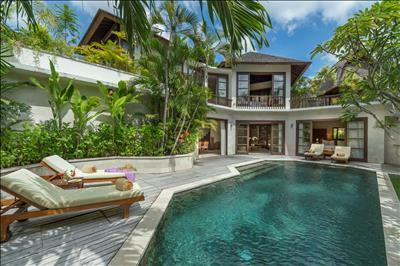 Complete with air-conditioned media room, fully-equipped kitchen and two double bedroom suites, this villa is not to be missed, and is often requested by our many returning guests. We had amazing time here and will definitely be back. Thank you to all the staff at villa Kubu!! We had amazing time here and will definitely be back , THE CARGIN FAMILY. 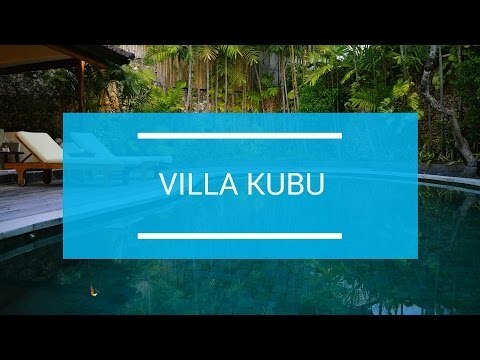 Thank you Villa Kubu so much for your smiles & helpful, positive attitude. We enjoyed a warm relaxing holiday! 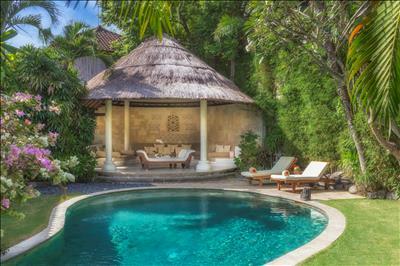 Thank you Villa Kubu so much for your smiles & helpful, positive attitude. Special mention to Nandi & the two Nyomans! We will definitely be back soon. The service was incredible and the food was mouth watering. Thank you for hosting our 6th family anniversary. 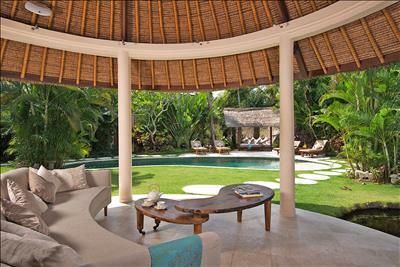 Our stay at villa Kubu was amazing. 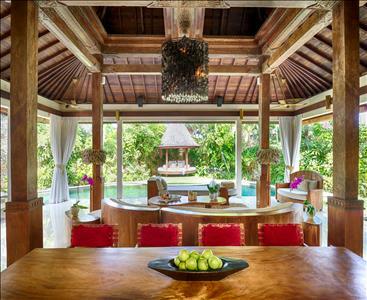 Our stay at villa Kubu was amazing. The villa 999 made us feel like royalty and the staff very kind and helpful, we will be back!!! !